Using our green screen studio, we can videotape your presentation and then add photos, videos, movies, and other media showing your products, services or personal/company information in the background or in the presentation. This provides for a very unique, personal, and cost effective audible and visual presentation that can be used to more effectively communicate your message to your intended audience. To view more on how Green Screen Communication Works Click Here. To help our clients to more effectively Communicate, Advertise, and Market their Products and Services to their present customer base, and/or to potential new customers, using green screen technology inhouse and/or using the Internet. Our studio facility is 42 feet long, 18 feet wide, and 15 feet high. We have a profesional lighting system set up for video or photography. 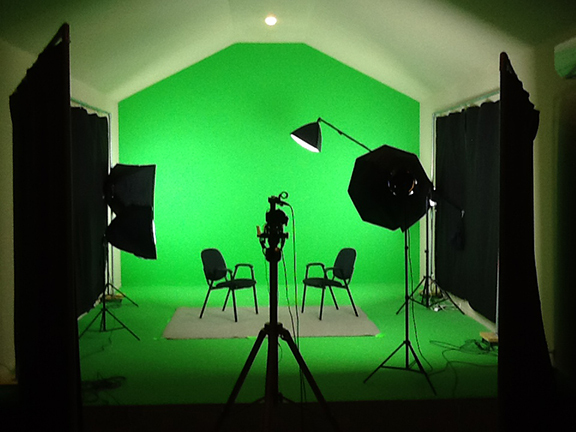 Our studio is also available for individuals and/or organizations to rent out in order to produce their own presentations using their own cameras and/or lighting equipment. Request a FREE Demo showing your Products and Services which will show how our service can greatly enhance your present customer communications and the marketing of your products and services!